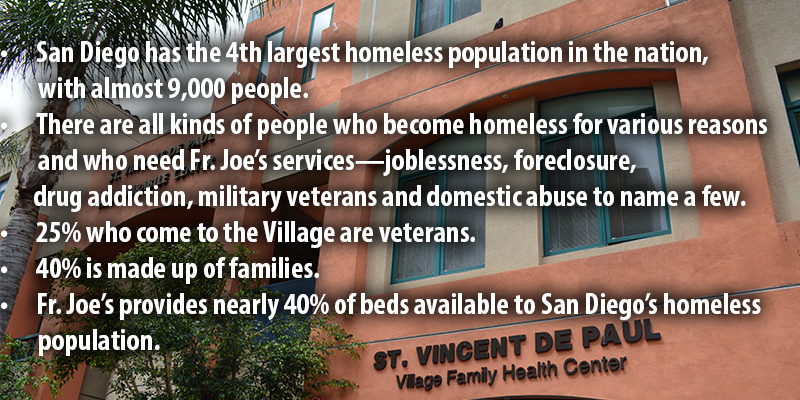 We recently had the honor and privilege of visiting Father Joe’s Villages in San Diego, CA— Southern California’s largest homeless services provider. What started out as a small chapel serving homeless people has grown into a cutting-edge provider of innovative housing programs with a slew of services to the homeless community—medical, dental, food, clothing, education, job training and child development in a one-stop-shop approach. Their goal simply is to stop the cycle of homelessness by housing those in need for up to 2 years at a time so they can get back on their feet, feeding thousands of people three meals a day, and providing them with all the requisite training needed to become productive citizens in society again. It sounds like a simple summary of their mission but a lot of coordination needs to take place behind the scenes for this 24 hour operation to succeed. Father Joe’s Villages thrives because of the dedicated volunteers, compassionate staff and the generous donations of the general public and private donors. We hope to bring you more inspiration stories highlighting many of the generous individuals that contribute so much to their communities in hopes of a better tomorrow. Father Joe and his team of servant leaders are doing an Amazing Ministry of Love. May God continue to bless their ministry abundantly.